Today, we’re proud to announce a partnership with Meals on Wheels America, a network of more than 2 million volunteers providing meals to those in need and homebound individuals such as seniors and wounded veterans. It’s an incredibly important time to step up to the plate and help. Not only are seniors the fastest-growing segment of the US population, they’re also at major risk of malnutrition and isolation due to lack of mobility. In many cases, a visit from a Meals on Wheels volunteer may be one of the only interactions these seniors have with another person in any given day. Senior programs are also experiencing federal and state budget cuts in addition to increasing transportation and food costs. Meals on Wheels currently delivers more than a million meals every week to more than 2.4 million seniors, but with better access to reliable, affordable transportation and more volunteers, local programs could deliver so many more. That’s why we want to help. As part of this two-year partnership, we’re making a $1 million donation (including promotional codes for volunteers to push a button to get a ride, as well as a direct contribution to the organization) to Meals on Wheels America in support of their 5,000-plus local programs across the country. 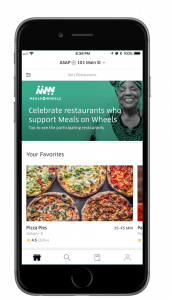 Uber employees will also lend helping hands at Meals on Wheels programs over the next two years and beyond. We recently kicked off our first volunteering events in cities like Chicago, San Francisco, and Washington, DC, where our teams helped deliver and package thousands of meals. Our customers can do their part, too. On Wednesday, November 22, restaurant partners across more than 60 US cities will be giving back to Meals on Wheels. You can show your support to these restaurants by tapping on the billboard at the top of the EATS app and ordering a special meal. Learn more about Meals on Wheels America here.